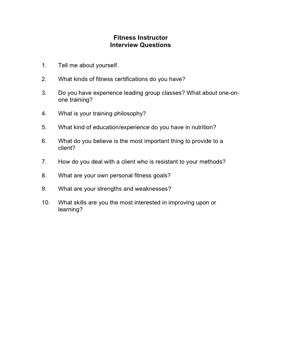 Choose your next Fitness Instructor with the aid of these helpful interview questions. 2. What kinds of fitness certifications do you have? 3. Do you have experience leading group classes? What about one-on-one training? 4. What is your training philosophy? 5. What kind of education/experience do you have in nutrition? 6. What do you believe is the most important thing to provide to a client? 7. How do you deal with a client who is resistant to your methods? 8. What are your own personal fitness goals?